In this tutorial you will learn how to install ViSP from source on Raspberry Pi 1 or Pi 2 equipped with an optional HD camera module. 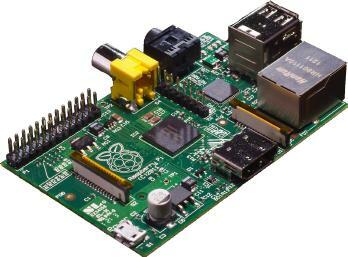 In a first section we give some useful instructions to start with a Raspberry PI. Then in the second section, we focus on the installation of ViSP from source. Format you SD card (at least 4Go are requested) on your computer. To this end you can use "GParted partition editor" under Ubuntu. Download Noobs "Offline and network install" zip file from http://www.raspberrypi.org/downloads. Unzip all the files on the SD card. Insert your SD Card into your Raspberry Pi. Plug in your keyboard, mouse, monitor and Ethernet cables. Your Raspberry Pi will boot, and a window will appear with a list of different operating systems that you can install. Select the "recommended Raspbian" checkbox and click on "Install" button. The default login for Raspbian is username pi with the password raspberry. Enter in menu "5/ Interfacing Options" to enable the camera. To load the graphical user interface, type startx and press Enter on your keyboard. This will later allow to use ViSP vpDisplayX or vpDisplayOpenCV classes useful to display images in a X11 window. ViSP is interfaced with several optional 3rd party libraries. The complete list is provided here. 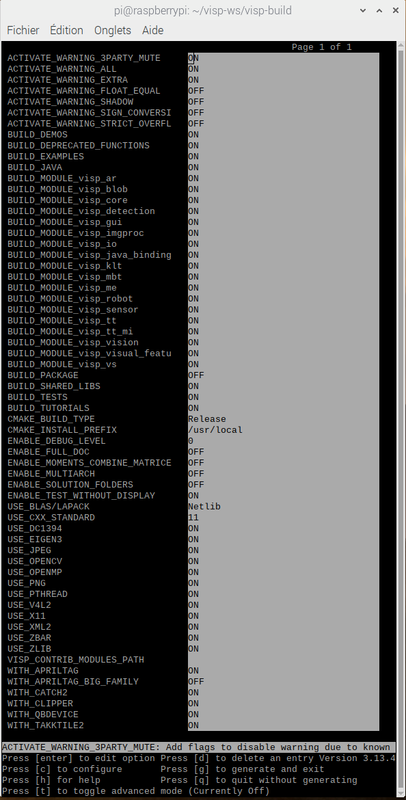 Snapshot of the ccmake ../visp command used to configure ViSP. You are now ready to see the next Tutorial: How to create and build a CMake project that uses ViSP on Unix or Windows that will show you how to use ViSP as a 3rd party to build your own project on Raspberry Pi or on any other system. Then if you have a Raspberry Pi camera module, you can also follow the Tutorial: Blob tracking especially subsection Tracking form v4l2 live cameras. You may also be interested in Tutorial: Cross-compilation for Raspberry Pi from Ubuntu host if you want to speed up the build process or deploy ViSP on other Raspberry boards. There is also Tutorial: Visual-servoing with mBot Ranger educational robot kit that uses a Raspberry Pi in order to control a mBot Ranger educational robot kit by visual-servoing.